FORT COLLINS — His name was Champ, but he was no champion. Then a high school sophomore living in Arvada, Webber responded to an ad for Champ at a Colorado horse rescue. The first time she saw him, three months after he had been rescued, she knew immediately that he was the horse for her — it was in his eyes. 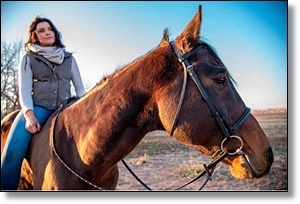 To read more on this story, click here: Horse Rescued From Northern Colorado Feedlot Turns Out To Be Descendant Of Triple Crown Winner FOLLOW US!